A view of the remodelling of Kinderton Street in October 1974, showing the drastic way in which the roadway was altered. The Boar's Head is on the extreme left and next to that is the building which is now part of the Kinderton Hotel. 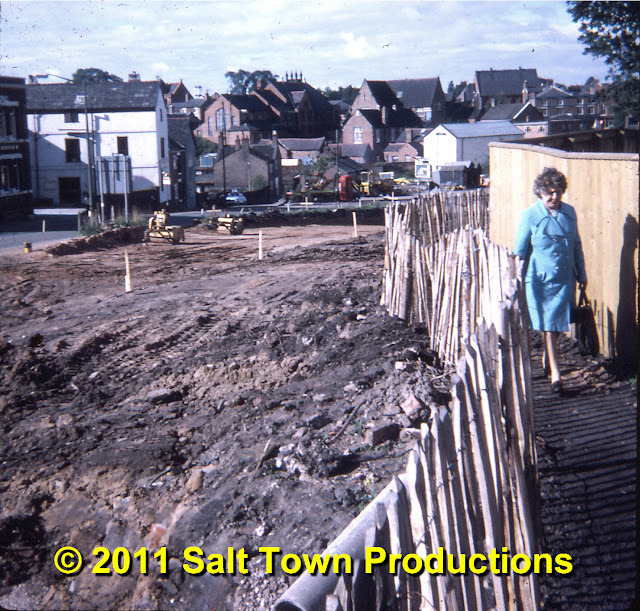 Everything from the bungalow by Town Bridge to the junction with King Street was swept away, including the Talbot Hotel, Flag Alley, Costello's and Whittaker's shops,several houses, a chip shop and, as we've seen, Moreton's farm house. Note also, in the background, the array of large buildings in Lewin Street which were also demolished shortly afterwards. Only Victoria Building, just visible above the white 'Kinderton Hotel' building remains. The precarious looking walkway on which the lady in the blue dress is walking was the only pedestrian access to King Street at this time, perched high up on the bank, and with only that rickety wooden fence to stop anyone falling over the edge. Geraldine Williams: A previous page shows Mary Costello standing outside her shop in Kinderton Street and the date shown is 1973. Dave Roberts I just found a slide dated 1972 (stamped July 1972 by Kodak) which shows St Michael's Way well on its way to completion.It would appear that Kinderton Street and St Michael's Way were separate schemes and that St Michael's Way was completed first. It's interesting to remember that it is THIRTY-SIX YEARS since these changes took place. St Michael's Way is still known as 'The New Road'. But that's nothing; the SUC Middlewich Branch is still known as 'The New Canal' and that's been there for getting on for 200 years.